America is voting Tuesday to fill the country's top job opening. The country also has over five million other jobs waiting for the right candidate. The Labor Department said Tuesday that America had 5.5 million job openings in September, close to the record high of 5.8 million openings set in April. 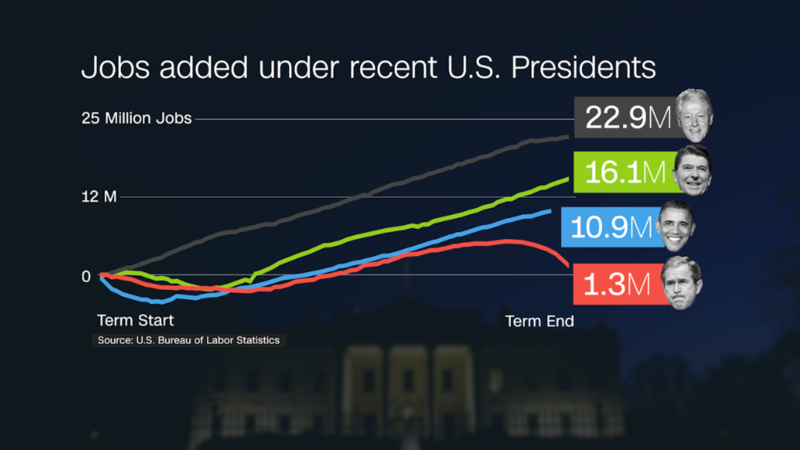 There was even a small increase in federal government job openings. It's a great sign that employers want to hire. However, this huge number of openings also signals that employers can't find the workers with the right skills for the open jobs that they have. The so-called "job skills gap" is a major problem plaguing the U.S. economy, and it's a key issue that the next president will have to tackle. It's one of the many reasons why the economy has been beset by slow growth for years. It also helps to explain why there are still high numbers of discouraged workers and people working part-time even though they want full-time jobs. Part-time workers are much more likely to live in poverty and live without benefits like health insurance or paid sick leave. The skills gap is also one of the reasons why U.S. worker productivity has slowed. Experts across the board say job training programs and apprenticeships are a key ingredient to fix the problem. President Obama has spent a record amount on apprenticeships during his tenure in an attempt to reverse the long-term trend of a decline in apprenticeship programs. White House officials like to call apprenticeships "the other college, except without the debt." The good news: Both candidates vying for the job opening at the White House have promised to spend more on building new roads, bridges and highways -- jobs that can help plug the skills gap and boost growth.